Planning your 2018 NAMM Show schedule? Click on the links below to see events by program, or view below to see a complete list of NAMM Foundation events at the show. You can also view a PDF of The NAMM Show Event Guide to see all NAMM Show events. Be sure to download the NAMM mobile app and add events to your calendar! The 2018 NAMM Show takes place at the Anaheim Convention Center (ACC) in Anaheim, Ca, and NAMM Foundation event locations include the NAMM Member Center in the ACC, the Anaheim Hilton, the Grand Plaza stage, and more. Music Education Days: Series of lightning-speed segments about innovative music education tools, nonprofit music programs and best practices from the classroom. GenNext: GenNexters have access to College Music Society programming curated specifically for students working toward a career in music business. 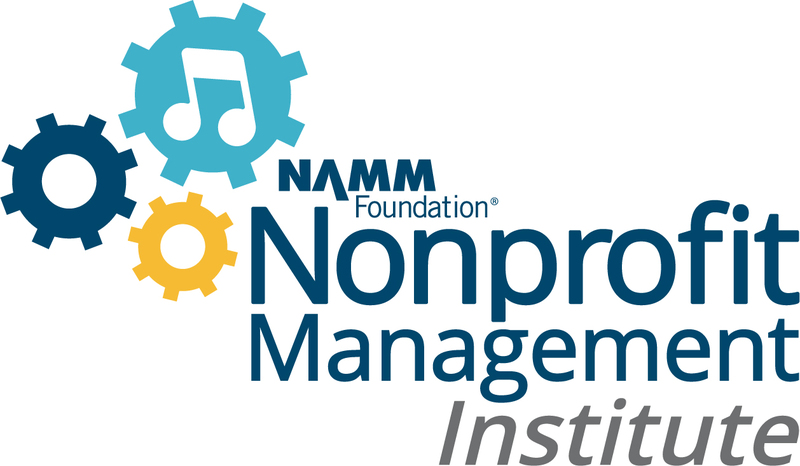 Nonprofit Management Institute: Nonprofit organizations, NAMM Foundation partners and Grantees are invited to attend the first annual Nonprofit Management Institute. The 2018 NAMM Show kicks off on Tuesday, January 23 with the fourth annual NAMM Foundation Day of Service at a local Elementary School in Anaheim, CA. NAMM member volunteers are needed to unpack and tune instruments (guitars, ukuleles, drums); interact and assist fifth graders during facilitator-led sessions in classroom settings; and pack and load instruments when the sessions are complete. Contact Claire Kreger-Boaz at ClaireK@namm.org to ask about volunteering. Presented by The NAMM Foundation. 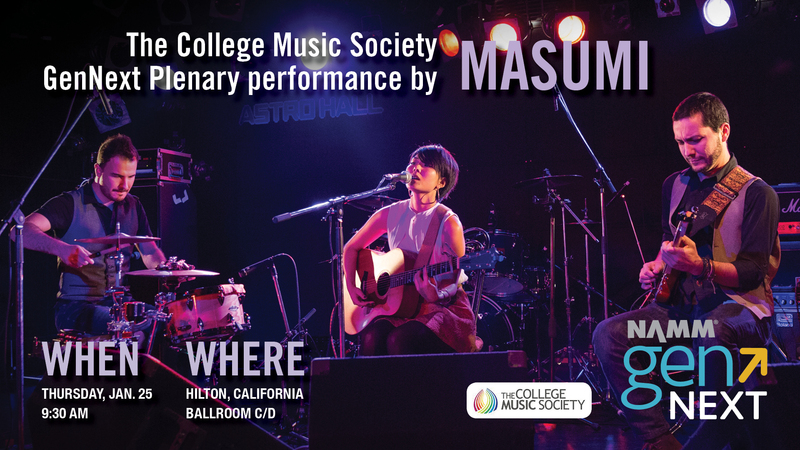 Kick off your GenNext experience with an inspiring performance by Masumi, with interviews and info to set you up for the best NAMM Show experience, ever! Presented by The College Music Society. College music students and faculty are invited to attend sessions presented by The NAMM Foundation and curated by The College Music Society (CMS) as part of the GenNext program at The NAMM Show. GenNext sessions offer professional development and valuable opportunities for students to explore careers in the music industry; for faculty to network with industry professionals; and for both students and faculty to attend special events catered to the college music crowd. Adaptability, preparedness, multi-tasking and professionalism are skills a young music professional needs to succeed in today’s marketplace. Attendees will walk through foundational business tools such as: SWOT analyses, purpose and value statements, creating a personal strategic plan, and generating a meaningful Plan A and Plan B. Presented by The College Music Society. GenNext Session: Career Opportunities in the Air Force Bands: Is It for You? Learn how the pay/entitlement system operates, work hours, physical requirements, audition process and expectations, benefits (promotion/retirement/health care), basic training, and commonly performed musical styles. This is a candid look from the inside; panelists share benefits and limitations of having a career in the Air Force Bands. Presented by The College Music Society. Learn to increase the value of creative ventures by participating in exercises that encourage the development of an entrepreneurial mindset. Survey results presented reflect thoughts from global music industry entrepreneurs and decision-makers. All aspects of the music industry sectors are included in the discussion. Presented by The College Music Society. This session reviews successes of direct-to-fan platforms such as Bandcamp and Patreon, and options for building direct-to-fan channels within streaming services that motivates fans to pay for their favorite artists, and examine factors that motivate fans to pay for recorded music. Presented by The College Music Society. Explore the obstacles and joys of programming concerts for traditional and non-traditional audiences. From making contacts and setting up concerts, to knowing your audience and exploring the engagement piece, to deciding how much to charge. Presented by The College Music Society. Explore careers in the music industry through wisdom shared from interviews with unique artists such as Sierra Hull, Bernard Purdie, Dom Famularo, Sheila Gonzales, Belmont University’s President Dr. Fisher, and Nashville studio engineer Jamie Tate, as well as my personal insights from 50+ years in the music industry. Presented by The College Music Society. Boards provide direction, fiscal oversight, and most importantly, a mechanism to plan for the future needs of an organization. Learn how to form your own 501 (c)3 and enlist board members, as well as what to expect your first year. Presented by The NAMM Foundation Nonprofit Management Institute. To build successful programs nonprofits need to include documentation and assessments as part of their program development. This session will explore how to implement them at the same time, with a focus on zeroing in on setting organizational goals. Presented by The NAMM Foundation Nonprofit Management Institute. Roomful of Pianos Session: Where Are Your Next Piano Customers Coming From? It’s a different world today for piano retailers. Competition is no longer just other businesses; its school sports, video games, iPhones and a firehose of other activities in kids’ lives. Piano customers are out there, but you have to go after them! This panel discussion will explore big ideas for getting new piano customers. Popyk and his team of experts will look at the benefits of learning to play the piano, working with teachers and tuners, the value of holding group lessons, going after the senior market, coming up with creative in-store and outside promotions, and much more. Presented by The NAMM Foundation. Drop by the Member Center on Thursday for The NAMM Foundation Nonprofit Networking Reception. Learn more about the organizations that share The NAMM Foundation’s mission to increase opportunities for people to learn and make music. Soft drinks and snacks will be served. Visit the spectacular Roomful of Pianos, the first annual festival of multiple simultaneous piano performances, attracting a small army of educators, pianists, and students; raising excitement and visibility for the most powerful, subtle, and versatile of instruments. Very advanced, rhythmically confident pianists are invited to sign up to perform. Ten pianists will be selected; the repertoire is Duke Ellington, “Come Sunday” (arr. Keith McCutchen), Leonard Bernstein, “Mambo” (arr. John Musto). Presented by The NAMM Foundation. NAMM Foundation donors are invited to a special reception with front row access to The NAMM Foundation for Music Education Celebration concert. By invitation only. Contact Sharon Bryant at Sharonb@namm.org for more information. 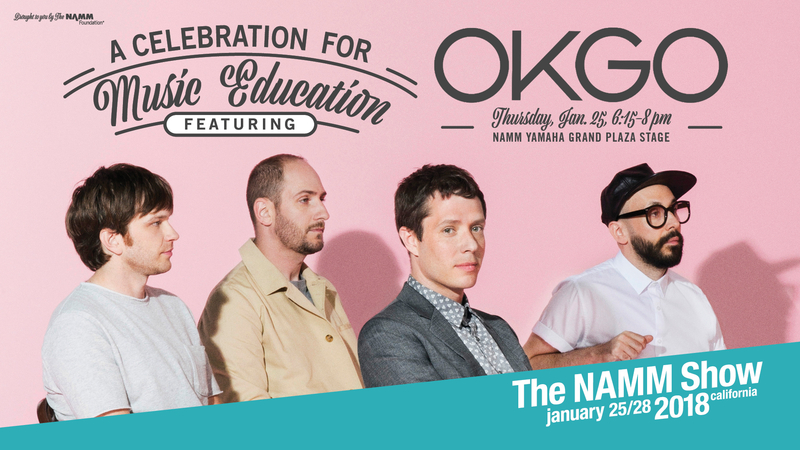 The NAMM Foundation celebrates music education on The Grand Plaza with featured artists OK Go. Gather on the Grand Plaza to celebrate the kick off to The 2018 NAMM Show! Career opportunities range from working for a university-level music school, music festivals, concert halls, for world-renowned musicians, public schools, individuals, or independently as a piano shop owner or private piano tuner and technician. Piano technicians’ work can supplement a performing, composing, or music theory career. Presented by The College Music Society. Nancy Tarr, music industry professor, SUNY Oneonta and executive director, Well Dunn; Emily White, talent manager, Whitesmith Entertainment, Inc. Secure iconic internships by networking with Well Dunn, a nonprofit that provides sponsored internships to qualified college students studying in the music and entertainment industry. Funded in small part by the Bonnaroo Works Fund, and Rick Farman, co-founder of Superfly Presents. Presented by The College Music Society. Ron Manus, chief business development officer, Alfred Music; Myrna Sislen, owner, Middle C Music; Crystal Morris, president and CEO, Gator Cases; Fred Flowerday, general manager, MakeMusic; and Alan Friedman, music industry partner and cofounder, Friedman, Kannenberg & Co. Explore a variety of career paths available to music majors from professional composers and performers to music industry power players. We will emphasize how their music backgrounds and education prepared them for, and continue to influence, their current positions. Presented by The College Music Society. Explore strategies to build your resume and attract the attention of music companies, by standing out among hundreds of applications. Learn to present your skill set to match industry demand. In addition, many practical resources will be provided to help you pitch your resume most effectively. Presented by the College Music Society. Examine the tangible benefits of completing a college music degree, with a focus on career paths available. Specific methods for presenting music technology and software skills, such as the effective use of DAWs, virtual instruments, DSP plugins, and notation programs, will be examined from both a creative and practical perspective. Review the type of education offered for Modern Music Technology at community colleges and 4- year institutions to private institutions; point out the differences; explore why you may choose one over the other. Panelists include representatives from professionals employed in the field, professional schools and 2-4 year colleges. Presented by The College Music Society. The SupportMusic Coalition on Coalitions for Music Education Advocacy Forum convenes NAMM members and music education colleagues working on state and local advocacy efforts to review ways Title I and Title IV funds are used to support music and arts education under year one of ESSA implementation. Lunch is provided. Presented by The NAMM Foundation. “Nonprofit” doesn’t mean you shouldn’t have a profit. And though there is no one formula to achieving profitability, a careful balance of earned, unearned, restricted, unrestricted, long-term and short-term revenue streams is critical to success. This session will explore strategies to find the right revenue sources for your organization. Presented by The NAMM Foundation Nonprofit Management Institute. Get to know your audience on social media to make sure you are getting the most out of the relationship. This session will explore social media strategies that build an audience for your work and build a network and/or fanbase for your organization. Presented by The NAMM Foundation Nonprofit Management Institute. This session tackles one of the most critical topics today: selling pianos in an online world. In this special session, Folenta will share unique ideas for creating more online piano sales and expanding your piano customer base. Find out what’s working today, and discover new (and interesting) ways to make your website more effective. Presented by The NAMM Foundation. 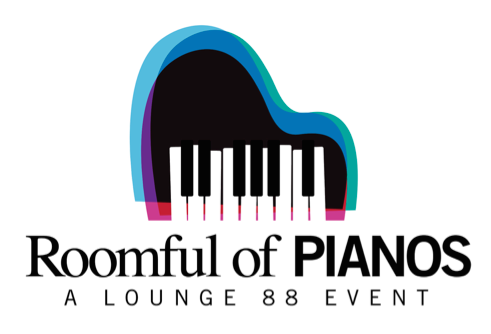 Visit the spectacular Roomful of Pianos, the first annual festival of multiple simultaneous piano performances, attracting a small army of educators, pianists, and students; raising excitement and visibility for the most powerful, subtle, and versatile of instruments. Advanced pianists (at the level of an undergraduate piano major or above) are invited to sign up to perform. Twenty pianists will be selected; the repertoire is Emmanuel Chabrier, España (arr. John Serry), Richard Wagner, Ride of the Valkyries (arr. Richard Blackford). Presented by The NAMM Foundation. Drum up enthusiasm for the music industry at NAMM’s annual All-industry Drum Circle, a can’t-miss NAMM Show rhythm celebration! Blow off some steam and get ideas for setting up fun, group-based Recreational Music Making experiences. Percussion instruments provided. Brought to you by NAMM in collaboration with Remo, Inc.
Group Piano programs are forming and growing across the country. Discuss best practices for building a student base, marketing, setting tuition, and choosing materials. Learn how creating piano-based RMM opportunities is doable, rewarding, and fun! Presented by The NAMM Foundation. 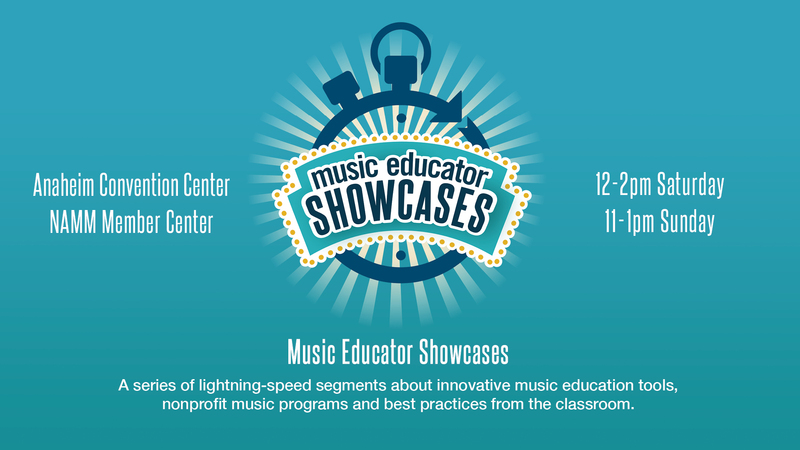 The Music Educator Showcases provide music educators, NAMM exhibitors, and NAMM Foundation partners and nonprofits, with an “Only at The NAMM Show” opportunity to learn about innovative music education tools, non-profit music programs and best practices from the classroom. Moderated by Eric Ebel, senior project manager, The NAMM Foundation. Music in the world changes every day with new artists releasing new material, with most of it never seeing a classroom. We can change that - plus share in the increased diversity of styles and cultures prevalent in our societies and modern music in general. The 3Dvarius is a new electric violin entirely created by the 3D-printing technology. Discover how we can create music instruments by using the 3D-printing technology and how music education can benefit from this new technology. Keyboards are a ‘key’ component of today’s music education classrooms. In this session, Casio demonstrates a commitment to music educators and students to deliver quality music instruction in schools with its comprehensive line of classroom-ready products. Learn about a new, flexible music curriculum called WindStars. This curriculum combines general music content with pre-band experiences and instrumental skills. Learn about the resources offered by Yamaha Corporation, specifically designed to inspire, equip and empower music educators. Psychologist K. Anders Ericsson coined the term ‘deliberate practice’ to refer to learning that aims at a specific goal, happens with an expert instructor, includes focused training, and uses immediate feedback. Learn how MakeMusic builds tools incorporating the philosophy of deliberate practice to support music educators. Creative Concept’s philosophy is all about filling the needs of an ever-changing music world both by creating instruments that reflect these musical styles and nurturing creativity in young children by engaging them through sound as well as the visual impact of a cool looking instrument! Music Educator Showcase: Teaching Guitar Workshops and YOU! Teaching Guitar Workshops developed in conjunction with NAMM/GAMA and NAfME in 1995, and has served more than 2 million students since then. Learn how to implement Teaching Guitar Workshops in your school--or how to sponsor a teacher to bring the program into their classroom! At the end of each hour, a 15-minute networking segment will follow the presentation segment, allowing attendees and presenters to exchange information. Learn to achieve good governance, solid program development and reflection, stable funding and community-building around your work. This session will present success stories that highlight methodologies that can be applied to the nonprofit program development. Presented by The NAMM Foundation Nonprofit Management Institute. Digital keyboards are changing the scope of the piano business in full-line, combo and piano-only stores. Are you making the most of this business-enhancing and traffic-generating product category, which has the potential for strong profits? This panel discussion will dive into ideas you may not have thought of for bringing new customers through the door by selling more digital keyboards, whether you’re a full-line, combo or niche music retailer. Presented by The NAMM Foundation. 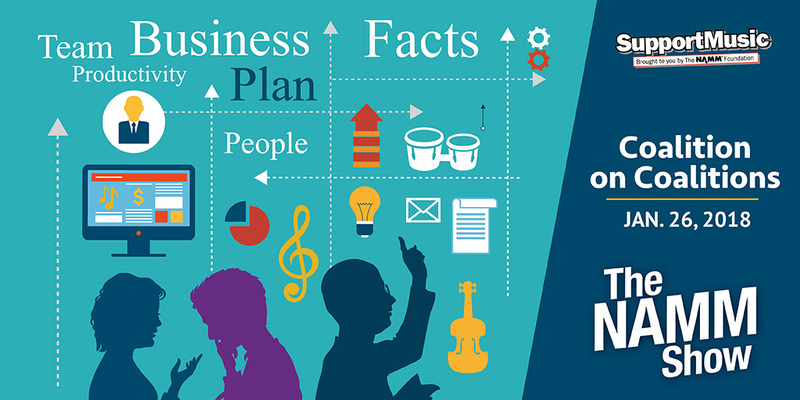 Michael Kamphuis, managing director, division of education, Conn-Selmer, Inc.
Stay updated on the many educational tools and resources from the nation’s iconic musical instrument manufacturer. There will be a drawing to win an educational clinic for your school; must be present to win. This presentation will highlight how collaboration with more than 35 music companies resulted in the use of the transformative power of music to enrich the lives of children and adults who are on the autism spectrum as well as those with other developmental disabilities. Noteflight Learn is a technology platform for creating, recording, and learning music using any device! Learn how to engage Noteflight in learning and performing in the modern music classroom. Music Educator Showcase: Just Add Ukes! Discover how one ukulele, two strumming buddies, three fingers, and your favorite songs can liven up learning in music and general education classrooms! This demo offers free materials, videos and support to make ukulele an integral part of effective teaching and learning. Music Educator Showcase: Jazz Ear Training with EarMaster Pro 6: "Sight-Singing the Blues"
This program is designed to introduce young students to the joy of rhythm through the use of the Bongolele® and Shakerlele® instruments. Rather than teaching note values and rhythmic notation, the goal is to coordinate singing with percussion and designed to precede the ‘Ukulele at School’ method. MIDI technology revolutionized music interface with technology and inspired more and innovative music makers. This session offers an overview of new features planned for MIDI and explains how educators can engage and help guide the evolution of MIDI. Learn about The Music Achievement Council’s First Performance National Day of Celebration to honor and celebrate all beginning instrumental music-makers who, as a result of their participation, will “graduate” to become a full-fledged band or orchestra musician. Learn strategies that successful music educators use to ensure a seamless transition from the first day that the student picks up the instrument through high school graduation - and beyond. All attendees will receive a flash-drive with materials to accelerate recruitment and retention efforts. Nashville-based powerhouse duo Towne performs. NAMM President and CEO Joe Lamond moderates a discussion among a panel of music industry professionals about what it takes to make a successful career in the music industry. This event is dedicated to SUNY Potsdam alumnus and long-time music industry icon, Sandy Feldstein. Presented by The NAMM Foundation. Visit the spectacular Roomful of Pianos, the first annual festival of multiple simultaneous piano performances, attracting a small army of educators, pianists, and students; raising excitement and visibility for the most powerful, subtle, and versatile of instruments. Advanced pianists (at the level of an undergraduate piano major or above) are invited to sign up to perform. Fifty + pianists will be selected; the repertoire is Gustav Holst, The Planets: Jupiter (arr. Greg Anderson), John Philip Sousa, Stars and Stripes Forever. Presented by The NAMM Foundation. 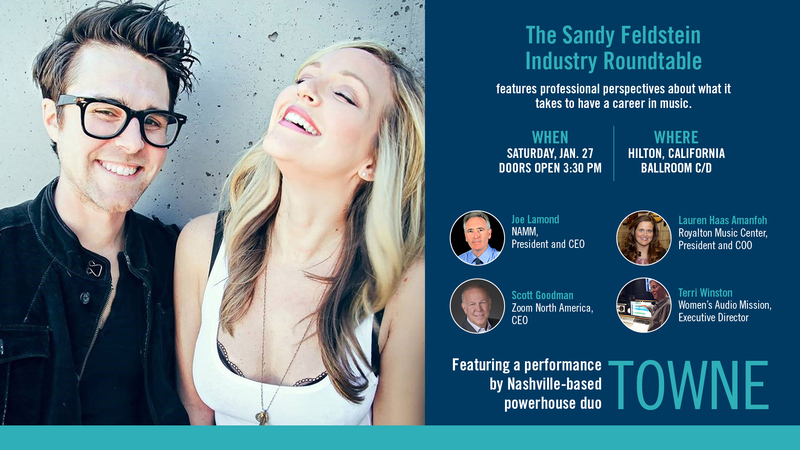 The NAMM Foundation invites college music faculty to a special GenNext networking reception to show our appreciation for all that you do to cultivate the next generation of music makers and industry professionals. Enjoy beer, wine, and light appetizers on us. This invitation in non-transferable. RSVP here. Melissa Irwin, senior sales and marketing, Rees Harps Inc.
Lightweight, affordable, quality harps have changed the universe of where harps can reasonably go and what they can now do. Among the easiest of all strings to play, harps are accessible and easily incorporated into your existing program. Learn how music educators worldwide are using harps to energize and expand musical offerings. Years of student participation at UCLA, San Jose State and Claremont Graduate University, along with thirty-one years as a music teacher informs Dr. Berry’s humorous, touching and always genuine insights into other 1st-8th grades music teacher techniques in: assigning grades, running rehearsals and performances, and establishing guidelines for working in a school. The Percussion Marketing Council brings drumming to educators through International Drum Month’s first-drumming experiences, Vans Warped Tour’s summer programs, Drums Across America's year around Lesson Tent, Percussion in the Schools’ programs with professional drummers and Drum Set in the Classroom’s school programs for hundreds teachers and thousands of students annually. pBuzz is the new award-winning beginner brass instrument from the makers of the best-selling pBone and pTrumpet. It enables students to get their first access to buzzing in simple and effective way and is the perfect musical instrument to sit alongside ukulele, recorder, and Boomwhackers in the elementary classroom. Music Educator Showcase: What Does it Mean To Be an Artist in the 21st Century? In 1919, a group of visionaries designed a new kind of university, one where creativity could be fearless and world changing. The New School was born. Today the College of Performing Arts houses three schools where students work across disciplines and train like artists to become a force of new artistry. Music Educator Showcase: Save the Guitar! The Fretlight Guitar has revolutionized the future of learning to play guitar. This new guitar learning system has moved the guitar industry towards a digital, instant-gratification generation of player, making learning guitar easy and convenient. Join us to discover how the Fretlight Guitar and the Guitar Tunes app are helping to save the guitar. The foundation of Heartbeat Music & Performing Arts Academy is college-focused curriculum. The academy uses the arts to encourage better grades and support families. Their day-to-day operations have proven that when parents support and see the value in what children are doing, children gain awareness and confidence. Things 4 Strings® accessories are teacher designed, tested and approved as the gentlest and fastest way for beginners to learn the bow hold. The relaxed and effective instant bow hold will optimize your instruction time and speed progress for your students! Bow Hold Buddies® for Violin /Viola and CelloPhant® for Cello/(French-style bow) Bass. Alfred Music is passionate about helping music educators focus on building teacher effectiveness, student growth, and best practices in pedagogy. Learn of opportunities available to you and your school’s music program from Alfred Music as your partner in professional development. Music tech has incredible potential in the classroom and beyond to help students unlock their musical creativity and collaborate on projects! BandLab is a free cross platform DAW for making music online. Find out more on how you can unleash creative tech in the classroom - with BandLab and its new class and assignment features. Use this 28-piece game to teach music theory; some knowledge required to play successfully. Includes full instructions and music terminology. Music Educator Showcase: But What If I Don't Play An Instrument? 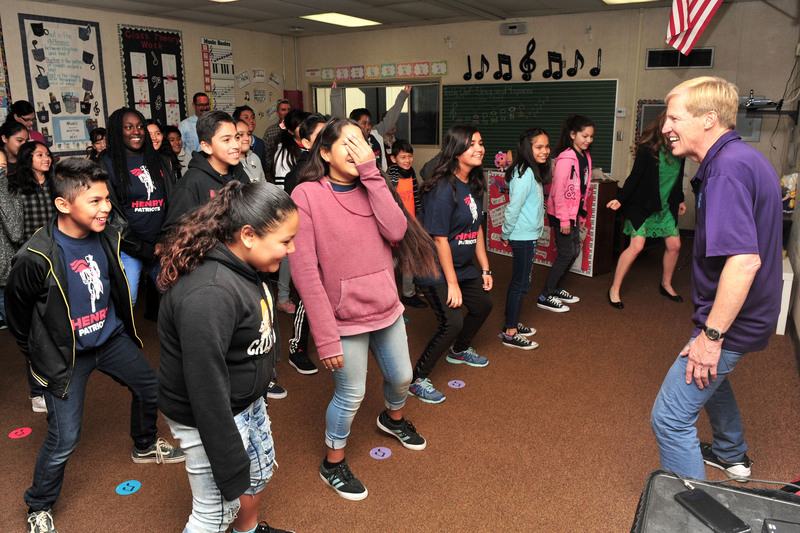 Corey Fournier, market development manager, Roland Corporation U.S.
With a few simple tools, teachers can engage both traditional and non-traditional students in a blended, inclusive environment that builds fundamental music skills, spawns collaboration, and fuels creativity. At Conservatory Lab, all students (pk-8) engage in student-driven composition projects that connect with academic learning and align with Common Core State Standards. This interactive session provides educators and curriculum designers with tips that demystify the process and offers tools that they can implement in their classrooms right away. The ONE Piano Hi-Lite is the first-ever piano strip that transforms any 88-key piano or keyboard into an interactive, digital instrument that teaches users how to play in minutes. The technology is compatible with Synthesia and MIDI files, and also has an AI component. Fender Play is an online guitar learning platform from the greatest name in guitars. It’s designed to get you playing in minutes. Practice anywhere, anytime as Fender Play guides you through hundreds of skills using bite-sized lessons. Play the songs you love while you learn. Anyone can play! Playing For Change Foundation is a nonprofit organization that establishes free music education programs for children in impoverished areas around the world. Learn about how creating a safe space for children to express themselves creatively has effected positive change upon the students and the local communities, while creatively building social media awareness. The Community Music Making Brunch and Learn is the place to discover tips for hosting in-store music-making events and activities that will engage first-time and seasoned music-makers. Continental breakfast is provided. Presented by The NAMM Foundation. Add the uke to your musical repertoire! Unleash your Island Spirit at our ukulele circle, where you’ll learn the basics of the instrument known as the “jumping flea.” No experience required, and we provide the ukes! Facilitated by Ukulenny. Presented by NAMM in collaboration with Kala Brand Music. Don't forget to use the hashtag #NAMMShow to share photographs of your time in Anaheim, California. See you there!